EXTREME Warning: This drink has very high levels of caffeine and sugar. Mega Monster Energy Drink is Monster Energy's extra large size can. A regular can of Monster has 2 servings, where as a Mega Monster has 3 servings per can. Since each 8 fl.oz. 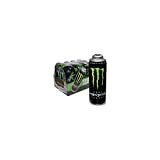 serving of Monster's standard energy drink has 80mg of caffeine and 27 grams of sugar, this puts Mega at 240mg of caffeine and 81grams of sugar. 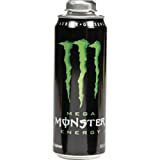 MegaMonster is the drink at the center of the death of 14 year old, Anna Fournier, who consumed two of these within 24 hours and suffered a cardiac arrest. Anna also had a pre-existing heart condition. Her parents are suing Monster Energy Drink for wrongful death and the FDA is now investigating Monster. Monster Energy Drink is on par with other drinks as far as caffeine content. Comparable to Red Bull, Rockstar etc. , but because Mega Monster provides 3 servings at once, it has more of a potential to cause caffeine overdose symptoms. In light of all the controversy, it will be interesting to see if Mega Monster survives on the store shelves. Carbonated water, sucrose, glucose, citric acid, taurine, natural flavors, sodium citrate, l-carnitine, panax ginseng root extract, ascorbic acid, caffeine, sodium chloride, niacinamide, riboflavin, guarana seed extract, inositol, glucuronalactone, pyridoxine hydrochloride, cyanobalamin. Sugar content: 81 grams (per 24 ounces). Mega Monster Energy Drink contains 10.00 mgs of caffeine per fluid ounce (33.81mg/100 ml).